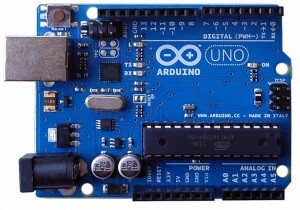 It’s called an Arduino Uno and it sells for $29.95. 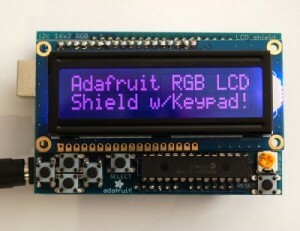 I purchased it from a company called http://www.adafruit.com/ However you can get it from a variety of distributors. It’s got 32 KB flash memory which is used to store programs, 2 KB SRAM memory that stores data that the program uses, 1 KB EEPROM memory which is sort of like a hard drive for storing data only as part of the chip and not really a disk drive. It runs at 16 MHz which for example is four times the speed of the first computer I ever owned. Across the top of the little black thing is a set of 14 digital pins that you can do input or output from. 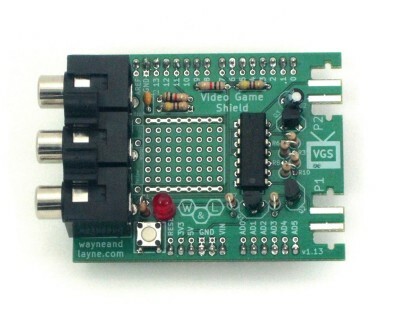 The lower right corner has six pins that you can use analog output. It has a USB port that powers it and connected to your computer. You write programs in a special little language on your PC and tell it to transmit them to the device through the USB cable. It then does whatever you’ve programmed to do. 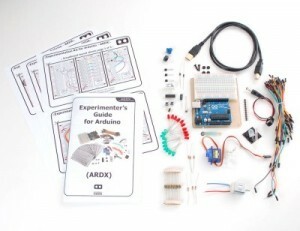 I went ahead and bought it as part of experimenters Kit that cost $85 which includes the $30 computer. It’s basically a bag of parts that say prototyping board, jumper wires, bunches of transistors, LEDs, resistors, switches, motors, temperature and pressure sensors etc. and a booklet that shows you what you can do with all of it. So far I’ve made it blink an LED off and on at one second intervals. I’ve hooked up a pushbutton and it sends a signal to my computer telling me whether or not the button is pressed. And the coolest thing I’ve done with it so far is hooked up a little servomotor like the motors that my dad used in his radio controlled model airplanes to work the rudder and flaps. I programmed the computer to make the servomotor wiggle back-and-forth. I could connect up to nine of these motors and position each of them at any angle I want depending on how I programmed it. People use them to build home robots. For another $24 I bought an LCD text display with a LED backlight. It displays 16 characters by 2 lines of text. They have these displays with multicolored backlights but I got a simple white text on blue background version . I’ve also ordered some infrared LEDs and infrared detectors. My plan is to turn the whole thing into a programmable custom TV remote control that I will be able to control multiple devices with only four or five pushbuttons. Currently I have a remote control in my bedroom that has a total of 14 buttons and of course I have to remember what each of those buttons do. This way I can cut it down to just some up, down, left, right, select buttons and it will display a mini menu on the character display and transmit it to my TV or cable box or whatever using the IR LED. There’s 1 million different things you can do with one of these. There are websites all over the place describing different projects that people have built most of them homemade robots. I have to wonder if there’s some sort of a little board similar to this inside toys like “Tickle Me Elmo” that drive the whole thing. Hell with time and patience in a few extra servos I could build a Tickle Me Elmo using this thing. I will probably eventually buy another one for $30 to be used permanently in whatever gadget that I build and then keep this one for tinkering with different projects. They’ve got all sorts of add-on circuit boards that will connect to a computer network, you can hook up a speaker and play music. They’ve got a voice synthesizer chip you can add. They even have a touchscreen display like this. It’s 2.8 inches diagonal and only costs $59. 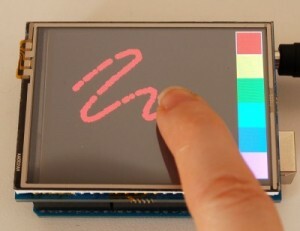 Another really cool add-on for $23 is a videogame interface. 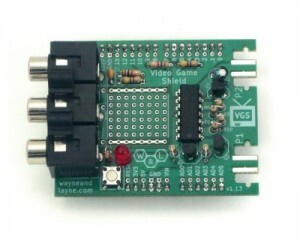 It’s a little board that you attach that has red/white/yellow video output jacks and two places to plug in Nintendo Wii controllers. Click here to see a video on YouTubethat shows a videogame created using this computer and the video add-on board. There are 1 million different things you could do with this gadget. I can’t wait to try them all.